How is this possible without dairy? Behold, the humble cashew. This little versatile nut legume makes the chocolate candy base so creamy that you won’t miss the dairy. The other secret ingredient– pure cocoa butter–makes the candy firm at room temperature, with a luxurious mouth feel and chocolate flavor. Did you know that cocoa butter is a popular home remedy for stretch marks? After stuffing my face with test batches of bark made with the stuff, I’d argue it’s too delicious to rub on your body! -If you don’t have cocoa butter, you can use coconut oil. Just be sure to keep the candy refrigerated if you go this route. -If you’d like to use Truvia, then use 70% or 85% cacao chocolate (i.e. Lindt or Ghirardelli) instead of the unsweetened kind. -If you use cocoa butter, try to melt it slowly over lower heat. I microwaved the cocoa butter to make a batch of the bark not pictured here and the candy showed extensive blooming after it hardened. Store the candy away from moisture in a tupperware container as an additional precaution for preventing discoloration. -If you are using store bought cashew butter, drain the oil off the top first. I drained off about 2 Tablespoons from the Tree of Life cashew butter I picked up at the local health food store. It’s usually just added safflower oil or sunflower oil to make the cashew butter creamier. In this case you don’t want that excess oil that would make the candy bark too soft. 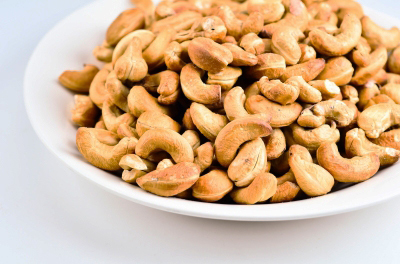 -If you are making your own cashew butter for this recipe, add the oil called for in this recipe to make the cashews easier to grind. Melt the coconut oil or cocoa butter and add it to the food processor before grinding your cashews into a smooth paste. I would only recommend going this route if you have a Blendtec, Vitamix, or other high power blender. -There is a step-by-step tutorial for grinding sweeteners into powder my e-cookbook, here! Melt together cocoa butter, chocolate, and cashew butter in a double boiler over low heat, stirring mixture constantly with a spatula until liquefied. Grind sweeteners (stevia, erythritol, xylitol OR Truvia OR coconut palm sugar) and sea salt together into a fine powder using a Magic Bullet or coffee grinder. Sift the sweeteners into the chocolate mixture, stirring and folding the sweetener into the chocolate to make it smooth in consistency. Break up any lumps by working the chocolate against the sides and bottom of the bowl with your spatula. Pour chocolate mixture on to a cookie sheet lined with parchment paper and spread it out in an even coating. 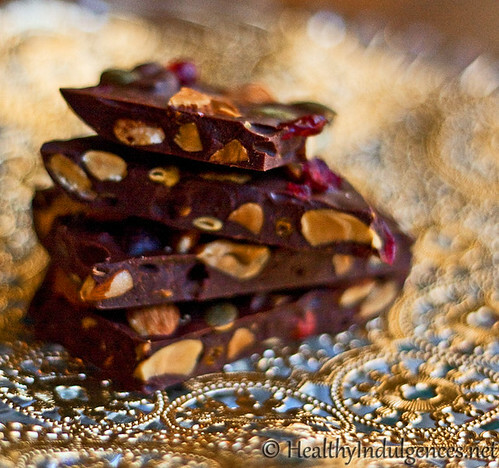 Sprinkle with dried cranberries, pumpkin seeds, orange zest, toasted sliced almonds… whatever you’d like in your candy bark! Let the candy firm up by setting it in a cool room, or speed setting it in the fridge. Break into pieces and serve. Pardon my dust as I sift through the 50,000 spam comments in the moderation queue and clogging up the posts. It’s a semester’s worth of spam… the mother lode of spam! It’ll all be taken care of as I clean up the site over the holiday break. The Healthy Indulgences Facebook page is currently the best place to ask questions since there are healthy treat lovers chiming in with answers there. You guys rock. 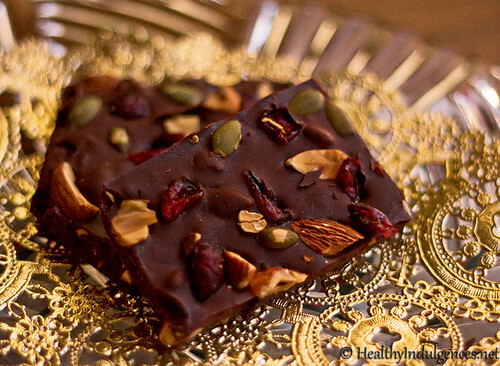 Don’t forget to check out the Kindle edition of the Healthy Indulgences Cookbook! If you’ve already got a copy, I’d love to know what you think. What sugar-free treats are you making for the holiday season? « Homemade, Healthier Pop Tarts! A sugar-free and scrumptious low carb version of the breakfast treat. 25 Comments on Homemade Chocolate Candy Bark and my Kindle E-Book! what a pretty dessert! love the photos– so rich and festive! great job, lauren! I saw that Ocean Spray has reduced sugar dried cranberries. Those would work, too, right? I bought the e-Book and just love it. I was down with a cold for the holidays, so made simple lava cakes for something special. I just got a rave review from my 20 something son, a rare feat, and no sugar coma. Hi, Deb! Glad the lava cake went over well with you and your son. Tell him there’s a 20 something single lady who’s got a million more ideas for gooey chocolaty desserts, LOL! 😀 I’m so happy you’re enjoying the book and the stevia. Thanks for your feedback! Hi, Terri! I have my preferences set to accept payments from people without paypal accounts. If you add the item to your cart and click the big yellow button to check out without paypal, you’ll see two options under “Choose a way to pay.” The first option is to pay with a Paypal account. If you look just below that, you’ll see “Don’t have a PayPal account?” You can pay with a credit card by filling out the form underneath that heading. You might need to clear your browser cookies first so Paypal wouldn’t detect the presence of another account if someone had previously logged into a Paypal account using your computer. Hope that helps, Terri! I appreciate the number of adaptations you give when creating this masterpiece. It helps to use what I have in my pantry. I haven’t tried them yet, but I plan to soon. Great idea. I have added your RSS to my blog reader, love your blog! And I can’t wait to try this recipe – it looks delicious. Hey Lauren, it’s Carolyn from All Day I Dream About Food. Mind if I include this on a round up on A Sweet Life Diabetes Magazine? It will only be an image and then link back to you. Thanks! Hi, Carolyn! That would be fine. Tweet me a link to the page when it’s posted. I’d love to see the spread! Hey Lauren, Can’t wait to try this. I also wanted to tell you that I added a section on erythritol to the second print and ebooks for both Fast Tract Digestion (IBS and Heartburn) books linking to your site. Thanks again for writing to me about the one good sugar alcohol. to match the cake for the persons persona. food restrictions that encourage optimal long term health. Multiple sclerosis is a chronic degenerative disease of the nervous system. Consult her close and relatives when preparing your guest list. series, has shared every milestone of her pregnancy with her fans. of party souvenirs to select from. ” In that study researchers observed how molecular imaging reveals origin of acid reflux disease. Once you learn how to eliminate this stomach condition, you will be on your way to better health. HCL assists with food digestion and supports the function of the LES. your self esteem and will only escalate if not dealt with.